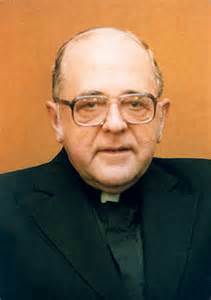 Father Joseph Fitzmyer, S.J., died peacefully this morning at Manresa Hall, Merion Station, Pa. He was 96. Father Fitzmyer was a leading Catholic biblical scholar, and we asked several scholars influenced by his life and work to offer their remembrances. I never studied with Joseph Fitzmyer, S.J., but the times I was in the same room with him, at meetings of the Catholic Biblical Association, for instance, his gravitas was palpable. If a question needed answering, you turned to Father Fitzmyer. He was a giant of biblical scholarship. No qualifiers need apply. He was not a giant of Catholic biblical scholarship, not a giant of 20th-century biblical scholarship, just a giant of biblical scholarship. Father Fitzmyer was, of course, a member of that first wave of Catholic biblical scholars whose scholarship had to be taken seriously by the academy at large because of its rigorous historical critical grounding and his scholarship was read and is read by scholars all over the world today. He was also dedicated to reading the texts as a Catholic biblical scholar, and he never ceased paying attention to the theological concerns of the text or his own place as a scholar within the church. I first came across his work as an undergraduate at St. Michael’s College at the University of Toronto, and to my professors he already loomed as a legendary figure. You can imagine how he seemed to me. My encounter with his scholarship did not diminish his reputation but grounded it solidly from that day to today. Given my frequent use of The New Jerome Biblical Commentary, it is fair to say that not a day goes by that I do not consult his scholarship. But this is not the end of it. I use his commentaries on Luke and Acts from the Anchor Bible Commentary series regularly. Indeed, these are only some of his major works, all of which are still in use and respected by current scholars, long after other scholars’ works have fallen out of fashion. One of the reasons has to do with his careful, thorough and judicious scholarship: You know that if Fitzmyer wrote it you might not agree with it, but it is grounded in a careful sifting of the available evidence and a discerning judgment of the data. He was also a master of the ancient languages, and his work remains a goldmine of linguistic nuggets. All of Fitzmyer’s work was quality work, which is precisely why he stands as a giant of biblical scholarship. All of his scholarship was dedicated to understanding the Bible more thoroughly and completely. He has gone to his well-deserved rest, may he rest in peace, but his scholarship will live on because of his precision and dedication to making the Bible come alive for all who encounter it. Along with Raymond Brown, S.S., and Roland Murphy, O. Carm., Joseph A. Fitzmyer, S.J., ("Joe Fitz" to all who knew him) was one of the leaders of the rebirth of Catholic Scripture scholarship in the 1950s, 1960s, and beyond. Today, with the complete freedom that Catholic biblical scholars have and the high esteem many of them enjoy in the upper realms of American universities and colleges, it is difficult to remember how dangerous and difficult it was for these three and their courageous brothers and sisters in the Catholic Biblical Association of America to champion historical critical exegesis at mid-century. The worst of the anti-Modernist suppression of scientific biblical research in the early 20th century had passed, but its "long hangover" plagued Catholic researchers up to even the early 70s. It was against such fierce fundamentalist attacks that Father Fitzmyer and his comrades fearlessly defended the best of cutting-edge biblical scholarship, while honestly criticizing the excesses of some. Along with many others, Father Fitzmyer marked the maturation of Catholic biblical research by moving the center of gravity of Catholic scholarship from Catholic seminaries to colleges and universities, be they Catholic, Protestant, inter-denominational or secular. Yet Fathers Fitzmyer, Brown and Murphy were determined that the specifically Catholic nature of their brand of biblical work not be lost. It was hardly by accident that one of their crowning achievements was the first and second editions of The Jerome Biblical Commentary, all of whose authors were Catholic. Fitzmyer's own work ranged widely. His degree from Johns Hopkins University was in Semitics, not, strictly speaking, biblical exegesis. Throughout his career, he continued to publish on questions of Semitic philology. But perhaps his best-known work (at least to the educated laity) was his series of commentaries, notably in the Anchor Bible series. His two-volume commentary on the Gospel of Luke and his one-volume commentary on Acts (which he had written as two-volumes, sadly reduced to one volume by the publishing house) became classics. They were later joined by commentaries on Romans and Philippians. A total bibliography of Fitzmyer's works would almost fill a small book. Remarkably, alongside his technical exegesis, he wrote many popular books and articles for the general public. He never lost the sense that there was a pastoral dimension to his apostolate. To some of his colleagues in academia Fitzmyer was probably a conundrum. His first-class technical work, which was never afraid to raise critical questions disturbing to some, flowed from a believing Catholic whose personal life and mores were very traditional. A devout Catholic, a faithful priest, a Jesuit fiercely loyal to his identity as such, he was also—for all his crusty exterior—a deeply compassionate Christian, ever ready to help those in need (I would have been lost as the new editor of the Catholic Biblical Quarterly without him at my side). At his passing, the "age of the giants" in Catholic Biblical research has in one sense come to an end. It remains for us who benefited from all his gifts to pick up the mantle of the master and journey on, with the help of his prayers. The Rev. John Meier is the William K. Warren Professor of Theology at the University of Notre Dame. With the passing of Father Fitzmyer, the biblical guild has lost another giant. Father Fitzmyer’s scholarly output and influence have been extraordinary. He was one of the co-editors (along with Raymond Brown, S.S., and Roland Murphy, O. Carm.) of The Jerome Biblical Commentary. With its publication in 1968 (a second edition came out in 1989), this landmark volume showed to the scholarly world that Catholic exegetes could engage in the historical-critical interpretation of Scripture at a high level; indeed, Father Fitzmyer was one of the most recognized and respected biblical scholars—prescinding from denominational affiliation. His painstaking work on commentaries was prodigious, as illustrated by the titles he authored in the prestigious Anchor Bible Series: two volumes on the Gospel of Luke and the volume on Acts of the Apostles (Luke and Acts comprises one fourth of the New Testament! ); as well as the volumes on Romans and First Corinthians, the two longest and most important letters of Paul. Father Fitzmyer’s scholarship was done from a Catholic perspective. He was a member of the Pontifical Biblical Commission that produced the important document “The Interpretation of the Bible in the Church” (1993). Unlike many exegetes who left such things to others, he examined theological questions raised in texts. Father Fitzmyer was also sensitive to their spiritual dimension, as exhibited in his Spiritual Exercises Based on Paul’s Epistle to the Romans. In addition, he was committed to making the best of biblical scholarship accessible to priests and others engaged in pastoral ministry—as well as to interested laypeople. The annual Institute on Sacred Scripture at Georgetown University, which will have its 54th iteration next summer, is aptly named for Fr. Joseph A. Fitzmyer, its founder. Thomas D. Stegman, S.J., is associate professor of New Testament at Boston College. "Fitz" was my Doktorvater. Ph.D.s like myself are a dime a dozen. Fitzmyer served as President of the Catholic Biblical Association -- an honor that fewer than 1% of us Catholic scholars will ever share. He was also one of the first Catholics to serve as President of the SBL -- you can count people who have served in both of those capacities, and still have fingers left over. Add to that that Fitzmyer was also appointed to the Pontifical Biblical Commission. The only other person I know who shared those 3 honors was Raymond Brown. He and Joseph Fitzmyer were giants.